Thirty hours in NYC, with wife, sister and two kids who’ve never been. How best to turn a potential burn-out into a rejuvenation of the creative juices? The NYIAS? No; leave the world of new cars totally aside, and focus on the source of inspiration, not the end product: Art. So while my daughter and younger son happily spend the second day on an eight-hour guided NYC tour, the three of us go to MoMA (Museum of Modern Art). After almost seven blissful hours soaking up Kandinsky, Picasso, Matisse, Gaugin,Van Gogh, and Monet, we exit via the sculpture garden, and I look back and see it beckoning me from the third floor: the Pininfarina. Back in we go. A fitting accidental capstone to a remarkable day. 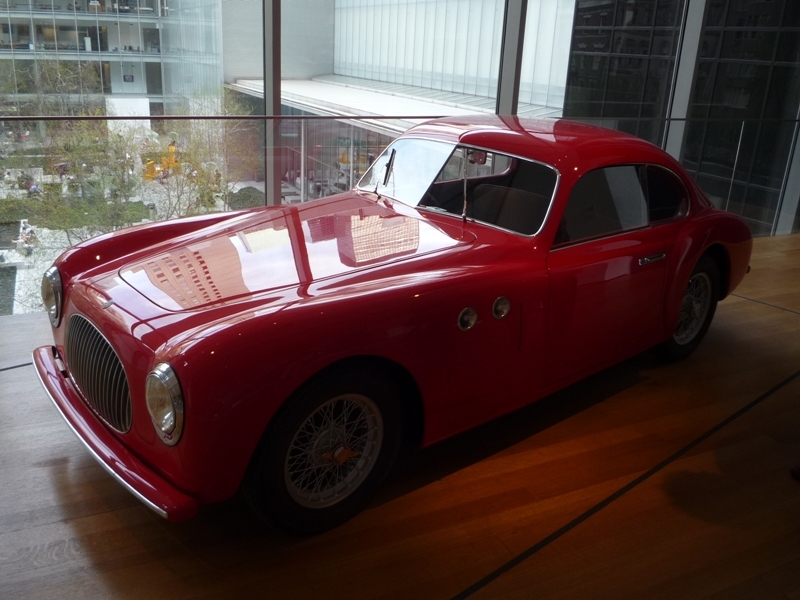 The 1946 Cisitalia 202GT Coupe is not at MoMA because retrospectively it is seen as a milestone car, perhaps the first to most perfectly encapsulate the design ethos of the post war era. It was already recognized for its pioneering role in its day: MoMA acquired a 202 in 1951, being the first car to be thusly honored. And it looks as good as the day it left the workshops where its aluminum body was hand formed (hammered) over wooden bucks. Is the Cisitalia a truly groundbreaking design? No. But then there almost never is. Or if so, it’s often so eccentric that it stays out of the mainstream, its ideas to be perfected by the masters of design. One just needs to work one’s way through the rapidly changing themes of modern art over the last century or so to appreciate that: ever changing, but the transitions and evolutions, and the borrowings and inspirations are (almost) always apparent. The Cisistalia is a masterpiece not because many of its themes hadn’t been explore before the war, but because it synthesized them so perfectly. Pininfarina’s Cisistalia reflects the groundbreaking and wind-splitting work done in the thirties during the aerodynamic revolution, and repackages it in the timeless proportions of classic era: long hood, short tail, and a hint of a rear fender peak. The perfectly slab-sided and radically re-proportioned streamliners were the pursuit of a functional ideal, and fender lines played no part in that. It might be a bit of a stretch, but I’ll take the risk and say that the Cisitalia was perhaps the first post-modern car, or the first retro design, thanks precisely to that delicious rear fender line. Enough analyzing and speculations. The Cististalia was the prototype of the post-war fastback coupe, and of course, most of all the Ferarris. The 202GT is the seed from which several decades of front-engined Ferarris sprang, as well as a host of imitators from the other Italian carozzerias. It firmly established Pininfarina as the dominant designer of the era, and his influence was lasting and profound, on both sides of the Atlantic. It’s a tiny little thing, befitting its roots in the Fiat 1100 sedan that gave its mechanicals to the cause. The Cisitalia is the Porsche 356 of Italy: borrowing the mass-produced engine and running gear from a sedan, and throwing a superbly-designed lightweight coupe body over them. The result was a 1700 lb delight with a tubular frame, 55 hp from the tuned 1100cc Fiat four, and a 103 mph top speed. Just one problem: it was ridiculously overpriced. At prices between $5 and 7k ($65k adjusted), it was twice the price of the much faster and larger six-cylinder Jaguar XK-120, and even some two thousand more than the Porsche, which at least had four wheel independent suspension compared to the Cisitalia’s crude Fiat axles. Not surprisingly, only some 170 of the Cisitalia 202s were made. Their role as a practical and competitive automobile was profoundly limited. But as a work of art, it’s found its place in the world along with the other masterworks of the twentieth century. With its prefect clarity of line, proportions, and sparseness of ornamentation, it may be a while before its current spot on the roost is challenged. It’s interesting to see this car, take in it’s shape and then try to imagine how it evolved into the visual assult that it did in the 70s through the 1990s. It’s just me, I’m sure but I cannot find art or beauty in a wedge. What a wonderfully descriptive phrase ! I might have used the word ‘hips’. Long live the Coke bottle. I can never get over how someone with nothing more than hand tools and experience can hand-hammer sheetmetal into something this smooth and beautiful. That may be the most beautiful “face” of any car, ever. Almost nothing to it. Chevy had fastback sedans in the 1940s, Paul. That would be interesting. I had a 1947 Chevy Fleetline fastback 2-door sedan, my first car. Trying to see out of it was like looking out the mouth of a cave. This was one of the early prewar specials with three chrome strips on each fender, a backup light, a glove compartment light, a fancy two-button heater, and an outside visor, just what that small-windowed car needed. It wasn’t long before I took out a neighbor’s mailbox while trying to back out of his driveway. I found a pic online…my car was all black with blackwalls but it had the same sun visor. I’m not sure the Aerodynamica Spider is comparable, it’s closer to a GP Auto Union. The modernity of the Cisitalia is the cohesion of Paul’s above-mentioned attributes, not just their inclusion. One aspect not mentioned, however, is the bonnet (hood) sitting below the level of the front fender tops; something attempted although more clumsily on earlier vehicles. As to the art/craft conundrum; Pinin Farina designed and built this magnificent vehicle. If Marcel Duchamp can place a urinal in a gallery and call it art, then these cars certainly have earned their place.